15.00" x 10.10" x 1.00"
Cons: You'd think you get better performance from its specs, but not really. Cons: This laptop broke after 3 months. Don't buy this and waste your money. I am contacting ASUS now but dont buy this junk. -I've been using it for almost a month now and everything works fine. Cons: Wifi card is not 5g and it's slow. I even purchased a new router and it's still just as slow. Wasted $180 on a new router because of this thing. Loaded with bloatware and it's fully bloated to the max. cortana has to be turned off but still shows up every now and then. It will give you pop ups wanting you to CLOUD. It just keeps on and on and on. Keyboard does not have a backlight. speakers sound like they are muffled. It's just not as expected. Pros: Fast, quite, and no cooling fan to get clogged up with dirt and dust. The speakers have very good quality compared to other laptops I have had in the past. Keyboard has a good fell to it. Received it within 4 days with standard free shipping. Cons: Only that the specs are off on the screen dimensions. It'a a 15" screen, not a 15.6". Saw the same inaccurate dimensions on the previous ASUS I bought for my room mate. The depth dimensions are inaccurate. Also, ASUS should have a CAPS light indicator. Other Thoughts: Newegg should get the spec facts correct in all categories. 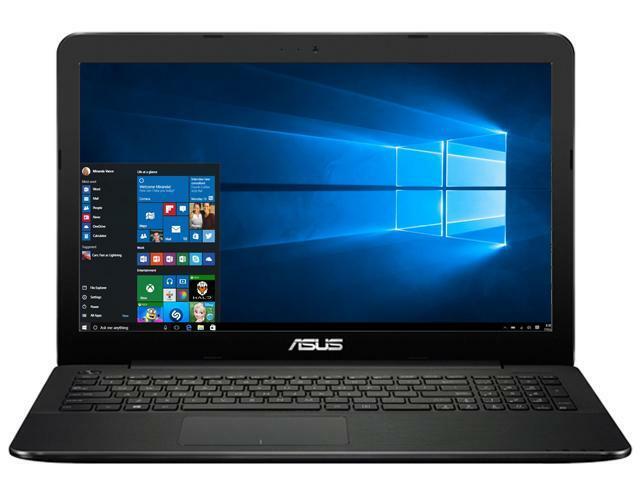 Other Thoughts: Bought this laptop for a very good price but returned due to low display resolution. Not a problem for gaming and watching videos but low res text will soon give you a headache. Pros: Startup is quick and programs run quite fast. Large display and lightweight. Can run multiple programs without lag, and will stay cool when using lots of RAM. Excellent internal speakers. Windows 10 has some nice features as well. Cons: Not the best display...contrast and colors are pretty dull. The built in webcam is garbage...don't even think about trying to skype with it. It is very low resolution with low frame rate. The keyboard surface is pretty flimsy cheap plastic, and the track pad isn't the greatest either. Other Thoughts: My macbook pro finally died the other day RIP. I really did love it but couldn't afford to get the logic board replaced (fried near the RAM inputs)....so decided to buy a new laptop within (roughly) my budget. I chose this model as it looked pretty impressive, reasonably priced, and felt I could get good use out of a new machine. I wanted to head back to Windows too because of compatability with my work files and programs. It's a good computer that'll get me by in the interim, however it's definitely not the quality of a macbook. After having it for 6 years, this bit of a downgrade will certainly make me miss my ole mac a lot more. Ahhh, maybe someday when I get rich and famous and can afford apple products, I'll return to it.